Police investigating the murder of a talented teenage footballer are continuing to hunt for a 16-year-old seen running from the scene. Kiyan Prince is thought to have been stabbed as he tried to break up a fight outside the London Academy school in Edgware, north London, on Thursday. As schoolmates and teachers paid tribute to the popular 15-year-old, police stepped up patrols in Edgware. Mayor Ken Livingstone has called for maximum sentences for knife carriers. Kiyan, who lived with his mother and 18-year-old sister, had been leaving school with dozens of fellow pupils on Thursday when police believe he became involved in an altercation. School principal Phil Hearne said teachers saw Kiyan collapse a short distance from the school outside Stamford Court, in Kings Drive, and immediately contacted the police. One officer administered first aid, but Kiyan died two hours later in hospital. Mr Hearne said his family have been left devastated. A full day after the attack, police are still trying to trace a suspect, described as black and aged about 16, seen heading towards Salisbury Court. 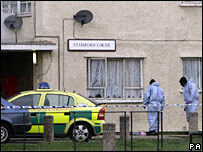 Meanwhile, a post-mortem examination was due to take place at Barnet General Hospital. Tributes have been pouring in for Kiyan who was described as "one for the future" by Queens Park Rangers bosses. 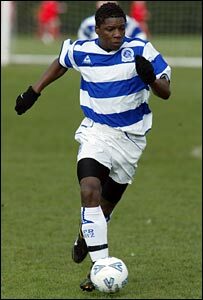 Head of youth at Championship club QPR Joe Gallen paid tribute to Kiyan, a striker for his youth team. He said: "It's a tragic loss to Queens Park Rangers Football Club, but more so to his family and friends. "He was a great lad, a terrific prospect, and it's a huge setback for everyone that knew him. "He was an intelligent, smart, good-looking young man with a very bright future in the game and he'll be sorely missed." QPR chairman Gianni Paladini said: "It's a sad day. "He was one of our brightest young talents and the way he went about his business was a credit to himself and his family." The school's principal Phil Hearne said: "Coming here to school this morning, I walked through school and talked to as many youngsters as I could and it is very, very quiet. "This is a school community that's very exuberant... we've got children sitting in corners either in tears or comforting someone in tears." He added that there were no gangs at the school and the attack had left pupils angry. The killing comes a week before the Home Office is due to launch a national knife amnesty as part of a no-tolerance approach to those who carry knives on the streets. Last December, Scotland Yard launched Operation Blunt in a bid to reduce knife crime in London. A police spokesman said they have stepped up patrols in Edgware since the stabbing but he stressed that knife crime is not a problem in the borough of Barnet. "On average there are only two knife-enabled crimes per week," he said. London Mayor Ken Livingstone described the killing as senseless and said he will write to the Home Secretary and the Lord Chancellor to call for maximum sentences for all those who carry or use knives. A Home Office spokesman said: "Sentencing is a matter for the courts but carrying a knife is illegal and won't be tolerated. It can land you with up to four years in prison." He added the Violent Crime Reduction Bill increases the age at which a person can be sold a knife from 16 to 18 and also provides powers for headteachers to search pupils for weapons. The London Academy - one of Prime Minister Tony Blair's flagship city academies - replaced Edgware School in September 2004, and has since received a glowing Ofsted report for delivering "exceptional" results. The hidden victims of crime?